In Tsukuba, as the days grow longer, here and there, slim shafts of greenery begin pushing up out from the snowless, brown, gray and straw-colored winterscape, giving us relieved assurance that once again spring has come. It is in this time of year that many Japanese can be seen scouring the roadside, field edges or riverbanks, as if looking for some lost object. 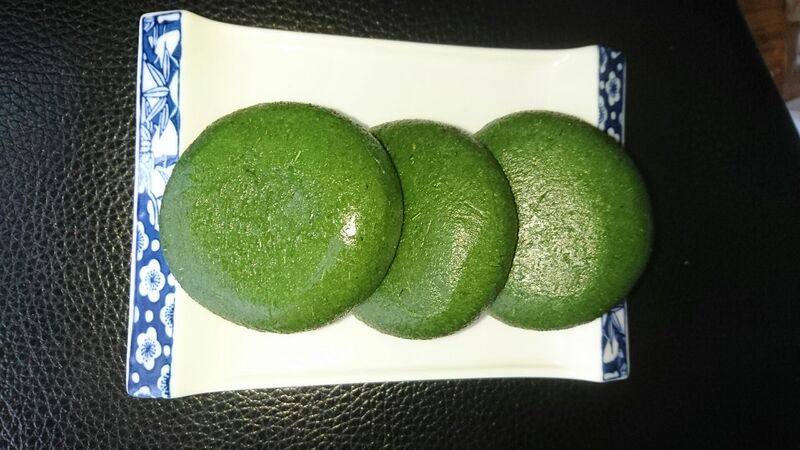 In fact, these people are searching for yomogi (蓬), a wild herb which is gathered to make this season’s most representative sweet – kusamochi (草餅), a distinctly green-hued (perfect for St Paddy’s Day!) 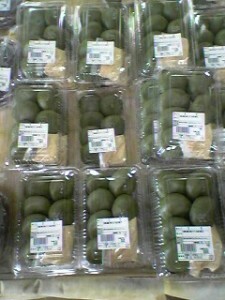 mochi-rice cake, sometimes filled with anko-sweet bean paste, or covered with kinako-soy bean powder. 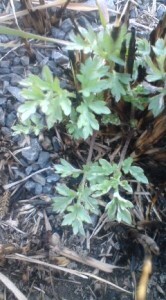 Since yomogi (mugwort in English, though that word does NOT sound very appetizing), becomes inedibly tough quite soon after sprouting up, it has to be gathered when still very small, young and fresh. (I remember doing this years ago, for the first time, in the field behind the Tsukuba Central Police Station!) 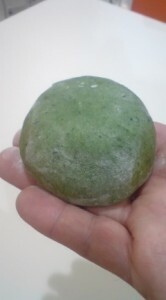 The herb is then boiled to make it less bitter, and then mixed into mochi (pounded rice cakes) and molded into small roundish patties. 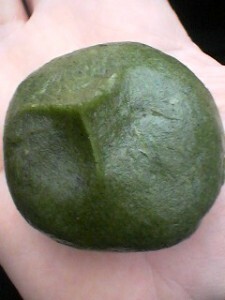 This gives the mochi a slightly bitter and grassy taste. 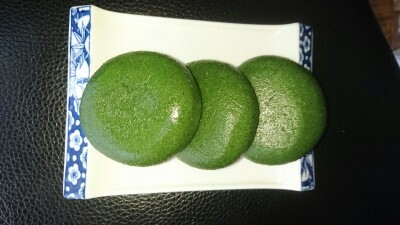 It is because of this flavor that the custom of eating KUSAMOCHI first began back in ancient China, where bitter grasses were believed to be effective in expelling from the body impurities and evil spirits. 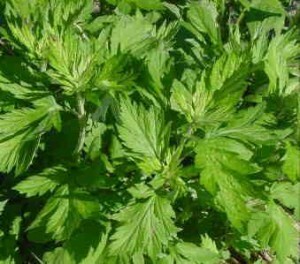 This notion was imported to Japan in the Heian Period (794-1192) though a different type of herb was used as the most common ingredient (母子草 hahakogusa or gogyou). It was only in the Edo Period (1601-1868) that yomogi became the distinctive component of KUSAMOCHI. In the present age kusamochi is also available at most convenient stores in this season and can of course be found at wagashiya (Japanese sweet shops). I had one today. Why don’t you enjoy the season and the tradition and try some for yourself ! My liking is “Hana mo Dangomo: loving both flowers and cakes ”! I also fond of a Japanese adjective “Shibui(渋い):gentle also stern, this is suitable meaning for good gentleman over 65? Like whom I would like to be. Kusamochi is for me that kind of cake. Avi-san introduced Mitono-ume, then Kusamochi, I hope in April Sakuramochi. I have read once in an article that to be a good gentleman one should know at least more than ten names of wild flowers and ten names of wild birds. For those conditions I only could pass. Avi-san has very sound knowledge quite wide area. Great Gentleman. Avi-san can be a principal of gentleman school or groom-school (the word “bride school” used be used very often but out of era now?). In so called gentleman school nowadays they should be taught how to cooking, sewing (simple ones like to put on buttons, or repairing of small tear of clothes), washing both tableware and wardrobe, ironing, making spicy irony too?, quoting several famous passages from Shakespeare or poets Basho(芭蕉), Buson〈蕪村〉, knowing match-results of footballs (soccer, rugby, American footballs, baseball, eyeball), should know at least 10 names of presidents of any countries, or prime ministers, a colonel, etc. ! Recently there is the new word in Japan “Ike-Dan : nice husband, be called from female side” meaning a good husband who willingly do housework or regard house-work as his hobby. “, already Ike-men(nice guy as used from female side)”has become a very popular word. Moxa cautery (Chinese way of burning dried plant leaves on certain points (Tsubos:important points of body) for curing diseases or symptoms uses dry leaves of Yomogi, My grand mother did it for herself but I never have not had them even I got a problem of bed-wetting until 5. (for this purpose grilled Imori:newt had been thought to be effective). I like the color of Kusamochi beside its taste. Dark green. Yomogi-Iro(Yomogi-color) reminds me very quiet-feeling. With color of Anko(sweet bean), dark violet, Yomogimochi looks very gentle and Jimi(plain) like gentleman over 68! By the way are there any sweets or cake with the color of Navy blue? I can not remind. (I have been and will be withering like those flowers during to watch this long-lasting rain and life, why you don’t visit me? ). It is very famous poem in Hundreds poem(百人一首),by Onono Komachi(the most female poet during Heian-Era(around 800-1100). She was thought to stay a while in Houjyo of the foot of Mt. Tsukuba. Also thought to be very elegant lady. Recently I often remembered my mother’s Kusamochi, because I sometimes see Yomogi by the roadside. When my mother was alive, she picked them up every spring, and made Kusamochi two or three times a year. Today on the way to my house, I dropped in one shop and found ones very similar to hers. I bought them & ate. They were different from hers. It’s because they were made from rice powder. She had made from just rice(Not Mochigome but Uruchimai), steamed twice, pounded by special old machine! Now I really want to make them by my normal machine someday!